"A Process of Cultural Acupuncture"
Playable City Lagos producer Hilary O’Shaughnessy has been blogging for the Guardian about “playability” – the idea that small, street-level interruptions can make cities more liveable, and spark conversations with friends or strangers about what we would like our cities to be. Hilary and the Watershed team are introducing the methodology behind the Playable City to Lagos this March, where it will be used by a group of local creative practitioners to address the challenges they and their fellow Lagosians face living in Africa’s largest metropolis. The methodology was born in Watershed’s home city of Bristol and the approach has been used for projects in Singapore, Austin, Recife in Brazil and Tokyo. Playable City’s legacy is creating networks to devise local solutions for local issues. “A key goal of our project is to develop local networks, so workshops are key,” says Hilary. 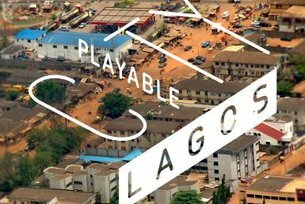 Playable City Lagos is a continued partnership between Bristol-based art centre, Watershed, and is supported by the Goethe-Institut Nigeria, Future Lagos and CcHub.